1. To Avoid Damage Caused by Snow Build-up. When winter arrives, it brings snow. This can become a major problems for commercial buildings with flat roofs. The snow and ice will eventually block the gutters and rains, which will cause the water to puddle up on the roof with nowhere to go. This excess water needs to be removed using a shovel, broom or squeegee. Next, you will sweep the roof so that any and all dirt, debris, etc. is removed from the roof. 2. To Avoid Damage Caused by Water Leaks. If the drains become clogged and are not unclogged, then a serious roof leak will likely develop. This leak could damage your indoor furnishings, interior flooring as well as the insulation in the attic. If water stands in a puddle on your roof, it is crucial that a roofing professional inspects the area and makes the necessary repairs to ensure this doesn't continue to happen. 3. To Avoid Damage Caused by Sheathing Cracks. When your sheathing begins to crack, it will cause leaks. Sometimes, the cracks can be caused by irregularities in the material or by normal wear and tear. Regardless, regular inspections can help to find any cracks in the sheathing of your roof. 4. To Avoid Damage Caused by Fungus Growth. Flashing damage is often caused by the growth of mold and fungus on your roof. This occurs when moisture continues to build-up in problem areas of your roof. As the fungus grows, it will cause the shingles and/or flashing to be pulled up and pushed away. Fungicide treatment will be necessary, in addition to the possibility of flashing or roofing material replacement. Regular roof inspections can catch all four of these before they cause damage. 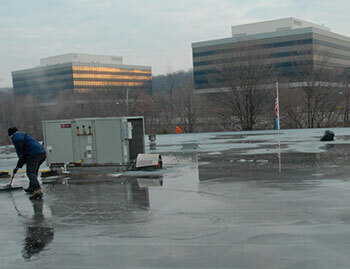 Contact A Plus Roofing today about commercial roofing maintenance plans that can help you maintain your flat roof.